Green Lantern Corps: Edge of Oblivion #5 Review 0 out of 5 based on 0 ratings. 0 user reviews. The universe counts down to oblivion. One can’t necessarily blame DC for putting all of its creative muscle behind the upcoming DC Rebirth relaunch, even if it comes at the expense of many current projects. That said, it’s been frustrating to watch so many of these books scramble to replace artists that have moved onto other projects. Nowhere has this shift been more disappointing than with Green Lantern Corps: Edge of Oblivion. 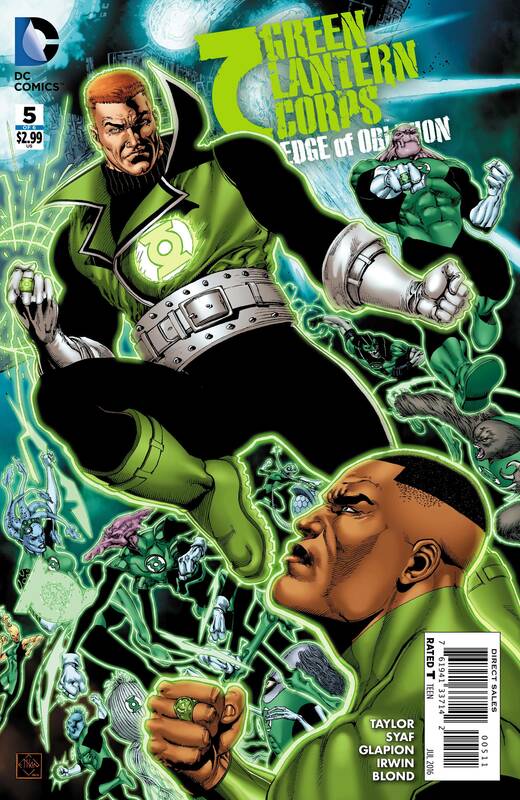 This mini-series still ranks as the best Lantern comic since the end of Geoff Johns’ long run, but losing artist Ethan Van Sciver midway through the series was a significant blow. This issue shuffles up the art team again, with Scott McDaniel providing layouts and both Ardian Syaf and Cliff Richards handling finishes. The result is still a very solidly rendered comic, with moments of visual flourish that recall Van Sciver’s bold, dramatic work. It helps that writer Tom Taylor has a very keen sense of how to pace his action scenes for maximum storytelling impact. That tight pacing shines through regardless of which artists are attached to a given issue. But in general, McDaniel’s layouts lack the cinematic quality of Aaron Kuder’s from issue #4, and the angular, Jim Lee-style figures from Syaf often clash with Richards’ more organic style. The conflict in this series took a fairly abrupt turn in issue #4 with the reveal that siblings Auras and Dismas are the true villains of the story, not allies to these wayward Green Lanterns. Not that this reveal was unexpected in light of Van Sciver’s distinctly villainous character designs. But regardless of which characters qualify as antagonists, this book has always thrived and continues to thrive on the strength of the Lantern group dynamic. Taylor clearly gets these characters and their clashing personalities, and he finds ways to allow each character to shine. Guy Gardner is very much the star of the show this month as the issue reflects on his troubled upbringing and how that trauma fuels his actions as a Lantern. This is a bold, exciting addition to the series, and it sets up what promises to be an epic finale next month. Hopefully one that’s, as much as possible, able to live up to the visual standard set by the first three issues. Unsurprisingly, Green Lantern Corps: Edge of Oblivion isn’t quite as strong in the wake of Ethan Van Sciver’s departure and the visual shakeup that’s occurred as a result. This issue has moments of epic visual spectacle, but also cases where the clash between art styles proves distracting. Luckily, there’s still plenty to love in Tom Taylor’s handling of the Lantern crew and the epic conflict they face as the end of the universe looms.